Nottingham Forest are interested in taking Andy King on loan from Leicester City, according to reports. Reds boss Martin O’Neill is keen to strengthen his squad this January transfer window to reignite the club’s play-off hopes. And it looks like 30-year-old King, a Welsh international, is in Forest’s sights to follow Yohan Benalouane to The City Ground. King has won League One, Championship and Premier League titles with the Foxes but has found opportunities hard to come by this season. He has made just one club appearance this season, in the FA Cup third round at Newport County, and three international games for Wales. King is the latest name to be linked with a move to the Reds, along with Bournemouth defender Tyrone Mings, Scunthorpe midfielder Funso Ojo and wingers James McClean of Stoke City and Celtic’s Lewis Morgan. 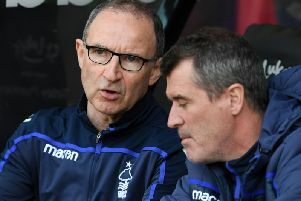 Meanwhile, the club is still hopeful former player Roy Keane will become O’Neill’s assistant manager.